Just as it did for its iPad mini event last year and its WWDC keynote, Apple is streaming its big event today live to Apple TV users. 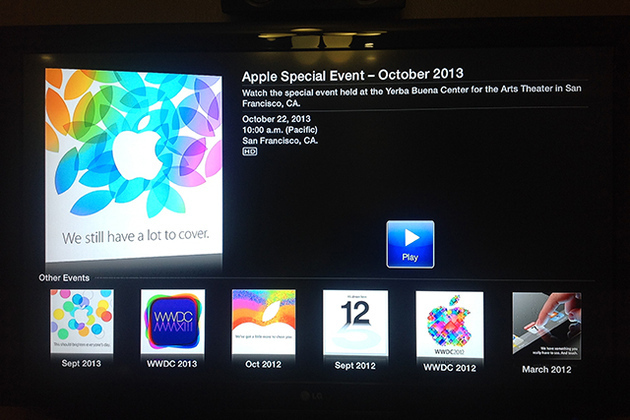 Anyone with an Apple TV will notice an "Apple Events" icon appear on their home screen, which acts as a shortcut to watch the event. For both the iPad mini and WWDC keynote streams, Apple also offered a livestream through its Safari browser for Mac and iOS. While we can't confirm that it'll do the same again, it's likely you'll be able to watch today's event on more than just an Apple TV. Want an idea of what's coming up? Browse through our preview of today's event.